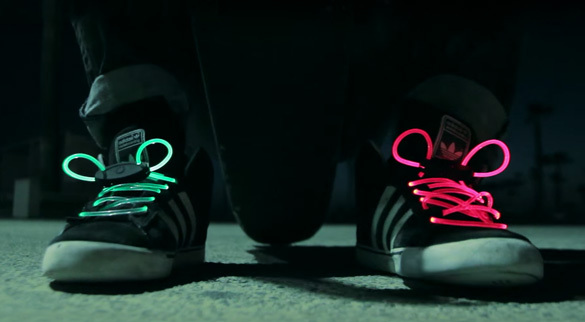 Get these awesome, eye-catching LED Shoelaces now from LED Montreal! They're super easy to put on and will give you up to 12 hours of continuous light! Make sure you get seen in the dark! The LED shoelaces are especially great for parties, evening jogging, camping, raves and all kinds of evening activities. You can choose between 7 different color options (red, green, blue, pink, yellow, orange, multi-color) in the drop down menu. They are fun and suitable for any kind of shoes, including running shoes, boots, skates etc. LED Shoelaces can also be worn as a necklace or bracelet or even tied around a handbag or backpack for evening decoration. How big is the battery pack, and where does it go? Can you choose what color you want to be "on" in the multi-color product? Or does it cycle through all colors automatically? Do these shoe laces have more than the on/off modes? Do they have blinking modes as well? What type of battery is needed? CR2032?